Go on an epic sword and sorcery quest in Raiders of the Hidden Realm, a 5 reel, 40 payline video slot from Playtech. The highlights here are the 3 free spin rounds which come with extra top-paying symbols, sticky wilds and multipliers. You’ll also see shuffling symbols that become wild. Stakes range from 40p to £500 per spin and it’s playable on desktop, mobile and tablet devices. 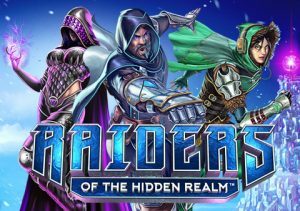 There’s a suitably fantastical feel to the design in Raiders of the Hidden Realm – with a giant ice fortress in the background, you’ll see gemstones, crystal balls and crystals spinning around the reels. The most rewarding symbols are the 3 characters, Sparks, Strider and Morgana. All 3 of these warriors spin in a stacked formation and can fill whole reels. Morgana is the best of the trio, paying 12.5 times your bet if you land 5 across a payline. There’s also a wild that substitutes for all other symbols. Morgana’s Free Games feature – land this round and you’ll get 8 free spins. Expect to see plenty more of the most rewarding Morgana symbol during the free spins. Strider’s Free Games feature – 7 free spins are awarded if you land stacked Striders on reels 1 and 5. Every wild that hits during these free spins will turn sticky and stay in place for any free spins you have left. Sparks’ Free Games feature – land this round and you’ll receive 6 free spins. Stacked Sparks symbols split into single wilds when they hit here. And that’s not all, they also turn into multiplier wilds and can send payouts rocketing by up to 5x. If you get more than 1, you can benefit from multipliers up to 25x! The free spins features aren’t the only extras on offer in Raiders of the Hidden Realm. Land the same character symbol stacked on reel 1 and partially stacked on reel 5 and you’ll activate the Raiders Shuffle feature. All of the character symbols from the triggering spin are split into singles and then shuffled around the reels. When they land, they turn into wilds and a new payout consideration is made. The comic book design works well here and matches the theme nicely. There’s plenty of potential action on offer here too, especially in the 3 free spin rounds. The Raiders Shuffle feature can certainly pep up the base game too. This is an enjoyable take on the classic sword and sorcery theme. If you like this genre, you should enjoy Raiders of the Hidden Realm. I also recommend you try NetEnt’s Warlords: Crystals of Power and Yggdrasil Gaming’s Double Dragons which also have a fantasy theme.